In a fascinating lecture in Los Angeles in 2008, David begins by examining the awesome megalithic structures in Peru and Bolivia and then launches into ancient technology, ancient electricity; ancient heavy machinery and ancient flight. He continues on with a discussion of Vimanas and the ancient Hindu Rama Empire. 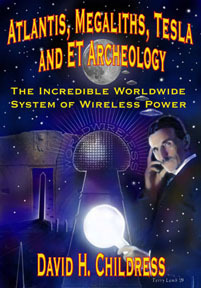 From there he discusses Nikola Tesla and his wireless transmission of power and its relationship to Guglielmo Marconi’s secret inventions, the Philadelphia Experiment and the genesis of flying saucer and flying wing technology in the 1930s and 40s. Childress winds up with an examination of unusual structures on the Moon--including obelisks, and of a worldwide wireless system of power through the use of obelisks and pyramids placed around planet Earth. A mind-blowing video on Nikola Tesla, UFOS, Vimanas, Atlantean technology and the incredible world before our own! All our DVDs are Valid in All Regions and All Countries!